NUL is currently in preparation for Season 2. Sign up now! Season 2 is currently schedule to start March 5th, which means that you have to apply your participation before that date. 4: The Coordinator will put you on the participant list in this post. 1: PM the Coordinator and state that you want to play with a rerolled team. The Coordinator will reply with some questions. 3: The Coordinator will put you up on the participant list. Hello Bodyschlompf, and greetings to all! I'd be happy to join to your league and play with you. 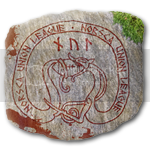 Am interested in playing in the Norsca Union league. I would like to join your League, most probably the feeder part. Pest eller Kolera want to play next season as well! Im gonna get a new team for next season. The new team will be the orcs and named "Firebringer's Rockafellaz". And I'll march ahead with my Bowlers! I'm gonna stay next season aswell but I'm gonna give up on those norse, not bashy enough. Gonna make myself an orc or dwarf team, don't know the which yet. I'll keep playing and will keep my team for one more season. I'm in too, Boom Bats will fly one the next season as well. I might need a break due to the amount of work my studies are bound to hand me (last semester). However, I'll keep my way too thirsty vampires whatever I do. I'll be back with an update when I can assess how much work it'll actually be (can't do that now).